Oh, I was gonna tell you, wait, I was gonna tell you about Holly Martins, an American. Came all the way here to visit a friend of his. The name is Lime, Harry Lime. Now Martins was broke and Lime had offered him some sort–I don’t know–some sort of a job. Anyway, there he was, poor chap, happy as a lark and without a cent. As soon as the voiceover ends, Holly Martins climbs off of the train and weaves his way into this pack of customs officers. Between Holly and the British MP, we get the following stilted interaction, Holly Martins responding swiftly to the MP’s questions, as if he’s so familiar with these interactions he knows exactly what question will come next. British MP: What’s the purpose of your visit here? Holly Martins: A friend of mine offered me a job here. British MP: Where are you staying? Holly Martins: With him. 15 Stiftgasse. Holly Martins: Lime, Harry Lime. Holly Martins: I thought he would be here to meet me . . .
Why is this double introduction necessary? Why is its wording so strikingly similar? We hear “Lime, Harry Lime” twice, so my first assumption was, of course, that Carol Reed wanted to introduce some sort of prestige to the figure of Harry Lime, since that phrase must be followed by the silent (but assumed) “shaken not stirred.” But the publication of Casino Royale and the inception of that bastion of British masculinity wouldn’t happen for another four years. Why then? Do we need to hear it twice to understand that Holly Martins has been offered a job? Or perhaps the second repetition only serves to show some of Martins’ character. Since we already know the content, this time through we may play closer attention to Martins’ bravado-laced tone or the way his eyes drift off to focus on another goal. Whatever the reason for this double introduction, Holly Martins steps into the scene like a lanky Sinatra, effortlessly navigates his way through customs, and floats out of the interaction leaning into his best impression of a hip-hop album cover and ready to take on the world, or at least meet his friend Harry Lime. Holly’s expression of aloof grace seems to show his lack of fear–he has not been intimidated by the presence of these occupying police, and is anxious more about his friend Harry than about the armed men who surround him. And yet in the back of his eye, there glows a glitter of doubt. Why isn’t Harry there to meet him? Why is he forced to navigate a strange city guided only by a street address? If anything could break through Holly Martins’ confident exterior it is the absence of his lifelong friend Harry, and in this frame, as he slides his passport back into his coat pocket, his eyes linger on the place where Harry might have been–should have been. He steps out of the train station with the stirrings of fear beginning to bubble inside him. A notable lack throughout the film, but particularly visual here, is the presence of the fourth power of Vienna–the Americans. Our introduction to the city divides it into its five zones, American, British, French, Russian and International, each policed by their own forces, except the International zone which is policed by four-officer teams representing all four interests. And here, Holly Martins is greeted by the officer from Britain. 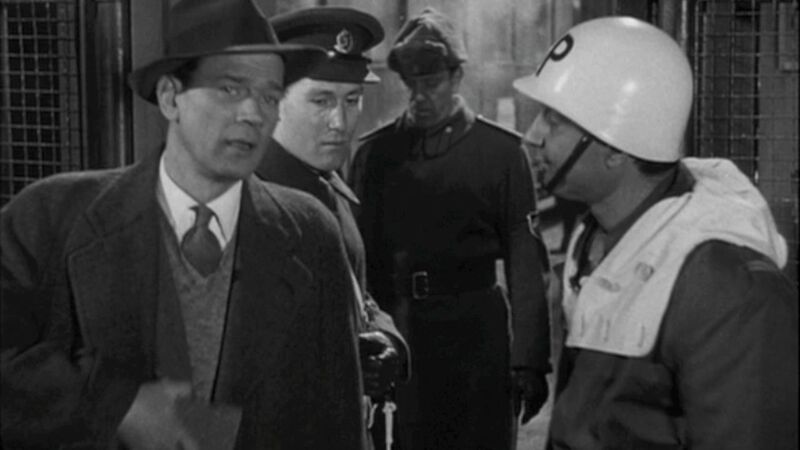 A few other official-looking types float through the scene, but for some reason, the American in Vienna is being welcomed by a British MP, rather than someone both better versed in the veracity of American passports and fraternally tied in the worship of the stars and stripes. The presence of Americans in the film is conspicuous in its absence, indeed the only American in this still is Holly Martins himself. It is possible that one of the ethereal floating figures who beleager travelers in this crossing might be an American official, but their wraith-like presence leaves as much impression as their lackluster welcome for a fellow countryman. 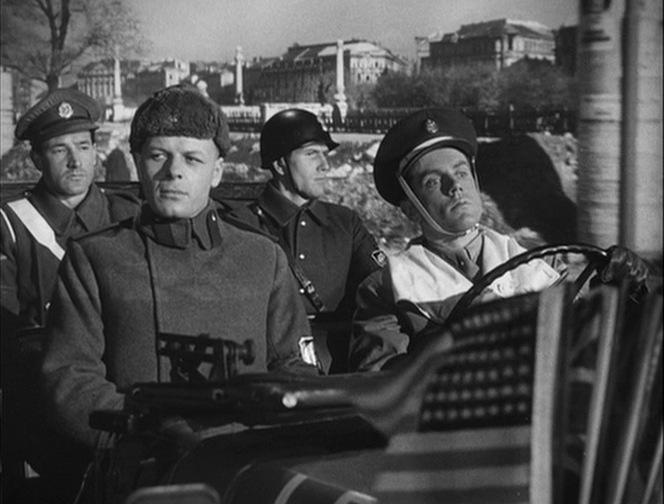 In fact, the entire film presents us with only one other image of an American official (below), driving a jeep full of representatives from Vienna’s four powers,”all of them strangers to the place and none of them could speak the same language,” says Carol Reed’s voiceover. His face presents him as a specter of a driver, barely present within his own body. In the coming film, Holly Martins will build friendships and rivalries with British officers, threaten Russians, and run from the French, but he will never interact with an American cop. Why is this? To answer this question I turn to Sigmund Freud’s The Interpretation of Dreams, for this film lends itself to dream analysis. It follows more of a zither-haunted dream of Vienna than the city itself and with its unexpected returns to iconic locations, distorted buildings and geometry and wildly canted framings, one might even think of this city as a nightmare of Vienna. But in Freud’s breakthrough book, he imagined an agency built into the human dreaming (and waking) mind; an agency he called the censor. The censor’s duty, said Freud, is to make the dream acceptable to the waking mind, a mind constrained by the ethics and morals branded upon it from birth. And this censor works doubly, through the form of secondary revision, the dream becomes recensored when it is being recounted by the dreamer. When presented with a dream, an analyst like Freud was actually presented with a dream-text that had been doubly censored, once in its primary perception and again in its retelling. In the analysis of said dream, as in the analysis of the film, one can learn the important aspects by simply focusing on that which is not present after the two passes of censorship. That which has been censored is what can tell the most about the dream’s true content. Vienna is a city of dreams and a city of Freud–he lived there from 1891 until 1938, a year before his death. Perhaps his ghost still haunts the city, forcing the manifest content of dreams to become apparent, but whatever the reason, the American authorities have been censored from this film like a bad dream. For most of our time here, our only representative of Americanism will be Holly Martins, the blustery pulp novelist who drinks too much and speaks no language but his own. But the brusque removal of American figures seems to tell us that this dream/film’s real intent has something to do with Americans.